REDWOOD CITY, CA--(Marketwired - Feb 24, 2014) - The programmatic marketing race is heating up, with advertiser categories such as arts & entertainment and telecom becoming up to 60% more competitive, according to the new Advertising Intelligence Index from Turn (turn.com), the marketing software and analytics platform. The report is the first to apply global standard economic models to measure trends in advertiser share of voice within the growing global programmatic advertising landscape. It offers marketers insights about when, where, and how to use digital advertising to best reach their most valuable audiences in highly competitive industry categories. 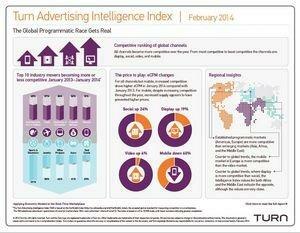 The report covers data-driven marketing trends across the Americas, Asia-Pacific, Europe, the Middle East and Africa from January 2013 through January 2014. The global analysis found that competition comes at a price within digital channels, with eCPM (effective cost-per-thousand impressions) for social, display and video advertising increasing year-over-year for January 2014 compared with January 2013. The exception is mobile: despite increasing competition throughout the year, increased supply appears to have prevented higher prices. In addition, proof of the surge in data-driven marketing is borne out by the 28% increase in use of first- and third-party data by brands looking to get an edge as they compete for consumer attention. The report (accessed at http://turn.li/2014febInsights) highlights many invaluable insights for marketers competing to reach relevant audiences through cost-effective digital advertising strategies. Along with revealing for the first time data on competition within key industry sectors -- such as apparel, financial services, food, and home and garden -- the report includes a wealth of global and regional insights that highlight the dynamics of the real-time advertising marketplace. This is based on an analysis of data from the Turn platform, which every day makes nearly 100 billion data-driven advertising decisions, analyzes over 1.5 billion anonymous customer attributes, and provides instant access to billions of digital ad impressions -- resulting in an unmatched ability to provide game-changing insights. "Global advertisers are always looking for an edge to determine which channels, devices, and times are most effective to reach their most valuable audiences," says Paul Alfieri, vice president of marketing, Turn. "By applying economic models to real-time marketplaces, Turn provides marketers with key insights about how to compete for consumer attention and deliver greater advertising ROI." Turn provides three real-time marketing applications: Audience Suite, an enterprise data management and audience planning platform; Campaign Suite, a digital media execution platform for video, mobile, social, and display advertising; and DataMine Analytics, a data exploration, optimization and warehousing solution purpose-built for marketers. Turn works with the world's top brands, agencies and trading desks, including Accuen, Aegis, AMNET, Chrysler, Experian, Microsoft, OMD, Thomas Cook, Toyota, Travelers, Verizon, VivaKi and Zales.